An aerial photograph showing the effects of Potomac waters in the vicinity of Hancock. 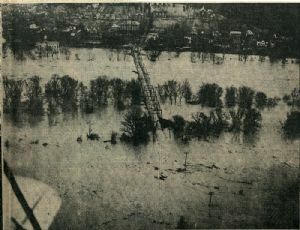 A view of Hancock and the highway bridge which was later swept out by the surging waters. Photograph taken from a National Guard plane piloted by Lieut. P. DeBrutz Jacques, of Washington county.